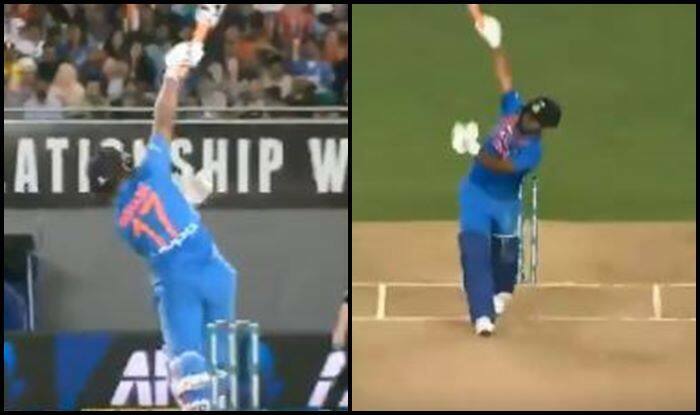 India vs New Zealand 2nd T20I: Rishabh Pant's one-handed six over deep mid-wicket at Eden Park during the 2nd T20I left Tim Southee in utter disbelief. India vs New Zealand 2nd T20I: Rishabh Pant’s one-handed six over deep mid-wicket at Eden Park during the 2nd T20I left Tim Southee in utter disbelief. Off the very next ball, Pant hit a boundary straight back down the ground to take India over the line. The one-handed six is something he has showcased in the past and is not something new in his repertoire. The two shots garnered applause for the pint-sized dynamo who remained unbeaten on 40 off 28 balls. His innings was laced with four fours and a solitary six of Southee.